You will also get your fill of passing boats! King bed in the master, two twin beds in the second bedroom and a queen size sleeper sofa. 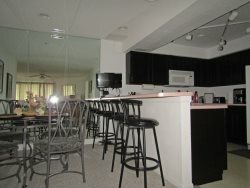 Includes full kitchen, washer/dryer, TV/VCR/Basic cable, fireplace, lakeside balcony with gas grill. 12x30 boat slip available for additional charge. You can relax at one of the 3 beautiful lakefront pools, lay or play on the swim dock, or rent a boat at the resort close by. Parkview Bay is located at the 19 mile marker and overlooks the beautiful State Park and is in the middle of Osage Beach. Within minutes you can be at the Outlet Mall, dining, and golf courses.